Earl Granville is a conversation starter. Some days it is the kilt and gas mask combination he fashions through city streets that gets people talking. Other days it might be the thick chains and cinder block (aptly named “Cindy”) he carries while crawling on a prosthetic leg through muddy endurance challenges that gets him noticed. The former Army Sergeant is at ease speaking to strangers about his tours in Bosnia, Iraq and the last one in Afghanistan where he lost his left leg in 2008 to a roadside bomb. But weighing heavily on his mind most days is another tragic loss — the 22 American Veterans who die by suicide every day. It is a loss that cuts deeply for Granville, whose twin brother Joe, also an Army Soldier, took his own life in 2010. Granville now shares his story with thousands every year in an effort to champion mental health and suicideprevention awareness. “It’s time to get rid of that stigma and use the resources we have,” says Granville. His message to all, especially his brothers and sisters in arms: “There is no shame is asking for help. There is no shame in receiving help,” he says. Granville received a specially adapted home from Homes for Our Troops in Scranton, Pa., in December 2013. The home serves as his basecamp between endurance challenges or “rucks”, in which he walks miles with a weighted backpack, symbolizing the burden that many Veterans carry post-war or post-trauma. 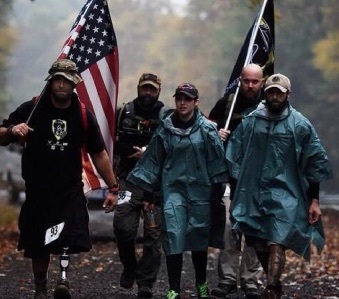 Many of the group rucks are coordinated by Carry The Fallen, a nonprofit organization dedicated to reducing Veteran suicide and assisting military families. In addition to raising awareness about suicide prevention, Granville has chosen to live a life that honors his two friends and fellow Servicemembers, Major Scott Hagerty of Stillwater, Okla. and Specialist Derek Holland of Wind Gap, Pa., who were killed next to him in the explosion. Granville has also been featured in several newspaper and TV interviews, including a PBS National Memorial Day Concert in which actors Joe Mantegna and Gary Sinise performed a dramatic reading portraying him and his brother Joe on stage. Granville’s journey will also be included in a documentary titled Power of One: Preventing Suicide in America. Says Granville, “It was an experience that will help me continue my mission of sharing my brother’s legacy and getting my message out to others battling their own mental demons.” Click here to read more about Earl.